Have you ever searched high and low for something and then discovered it was right in front of you all along? Amazing friends, that is exactly what happened to me! 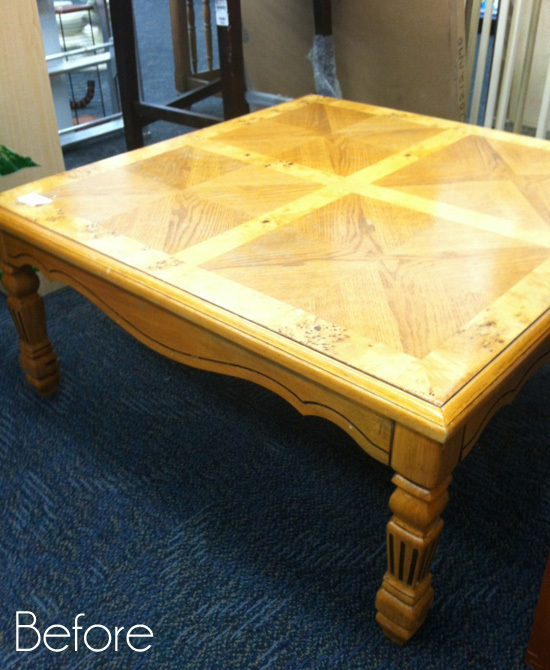 I have been on the hunt for a new coffee table since we moved in and have had no luck. Much like when I was looking for a kitchen table (See the one I ended up with HERE if you missed it. 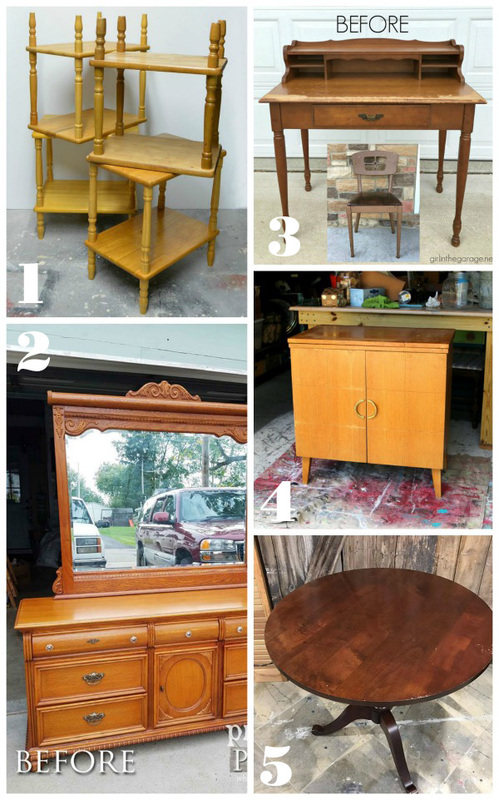 ), I even went searching every furniture store in my area totally willing to pay retail if I found something I liked. Nope. And of course I’ve been keeping a look out at all my favorite thrift stores as well. I even went yard saling last weekend and nada. Then as I was watching TV on Saturday night with my feet propped up on my old coffee table, it occurred to me…why not redo the one I already have?? Duh! So that is exactly what I set out to do! For ten whole dollars this table in a glorious shade of orange was all mine. It worked well in my old space with its creamy white background, but not so much in the new one. 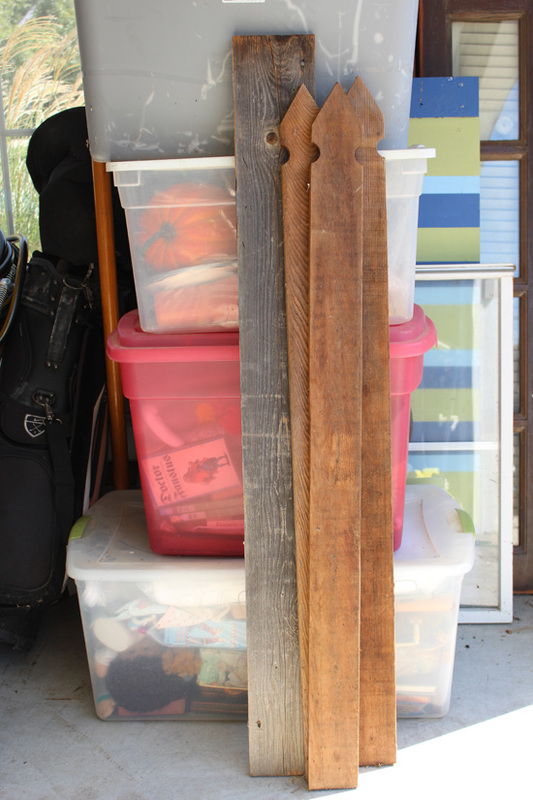 If you missed it, you can see what our garage looked like when we moved in, and see the enormous amount of junk my Hubby had to move over in THIS POST. 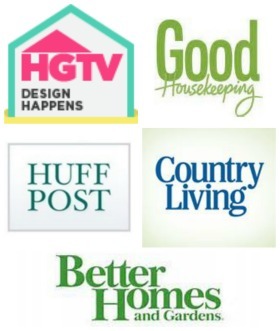 I am including a few affiliate links so you can find the products I use. Aren’t they beautiful? Never even been used! Just laying out in the elements aging to perfection! 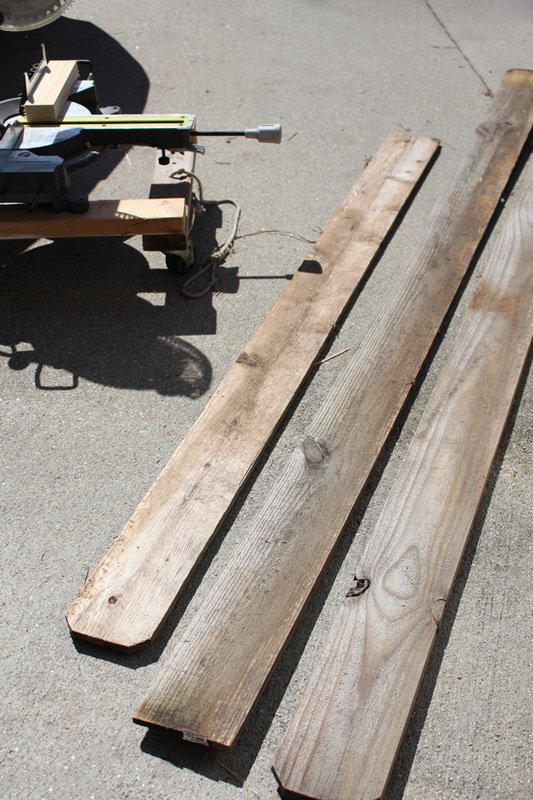 I started thinking I had the makings of a new top for my coffee table…and I did! 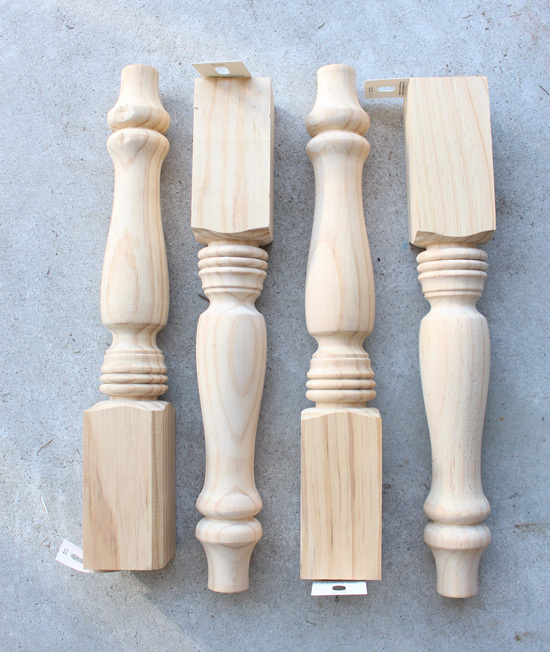 I used two of those long pickets plus the few pieces my hubby had saved to create the new top. Using my miter saw, I cut each one to the length I needed, and I did have to rip one down to size lengthwise with my table saw as well. At this point my Hubby said it looked like something you would see in a frat house. Ye of little faith. I added several screws along each plank to hold them in place. 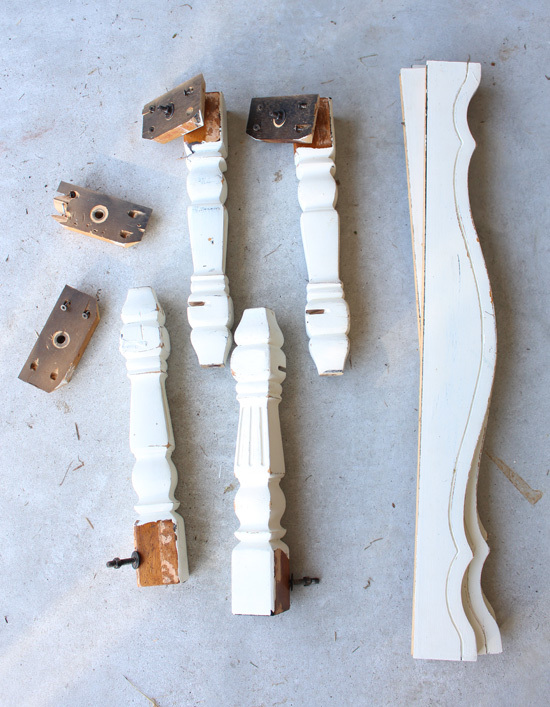 To redo this table, I knew I would also want to replace the legs and remove the curvy pieces all around the sides. Skip ahead if you don’t need to see how the legs and side pieces were replaced! The legs were kind of wimpy and had these notches in them that must have held a shelf of some sort under the table at one time. Regular pliers probably would have worked better, but these did the job. They were $10 a piece, but that was still way cheaper than new table. 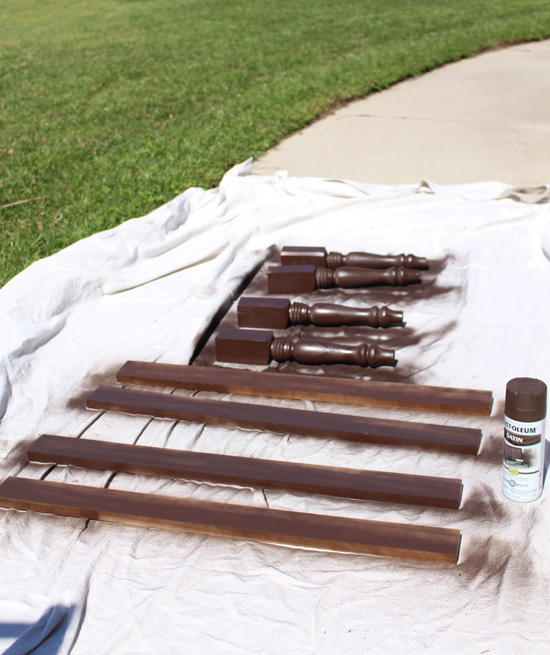 I wanted brown to show through rather than new wood when I sanded them after painting. 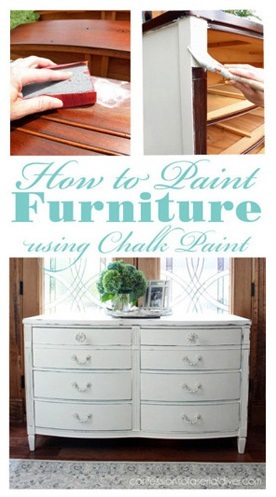 They got three coats of DIY chalk paint in Behr’s Ultra Pure White. Here is a quick how-to for using this awesome tool! Determine the width of your board. 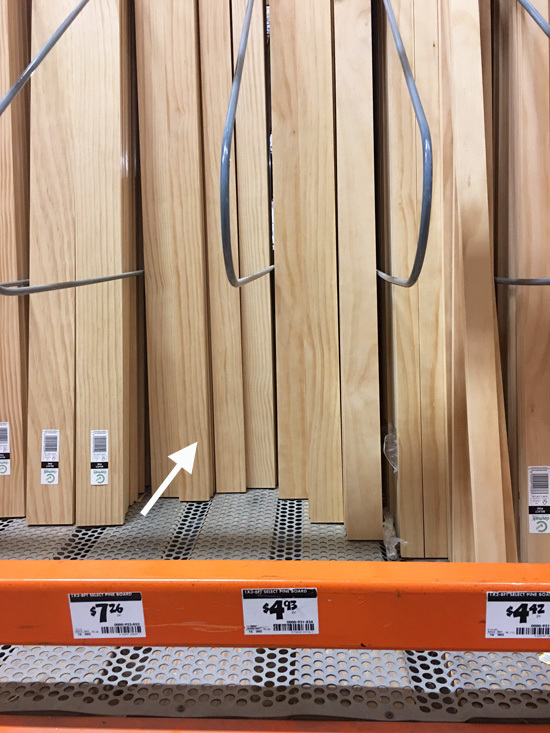 Mine was 3/4″, so I selected that size on my Kreg Jig by aligning the arrows on the gray sides with the correct size. The kit comes with a drill bit you use with your drill. Move the ring on the drill bit to the 3/4″ mark (shown on the grey area beside where it is stored in the box). 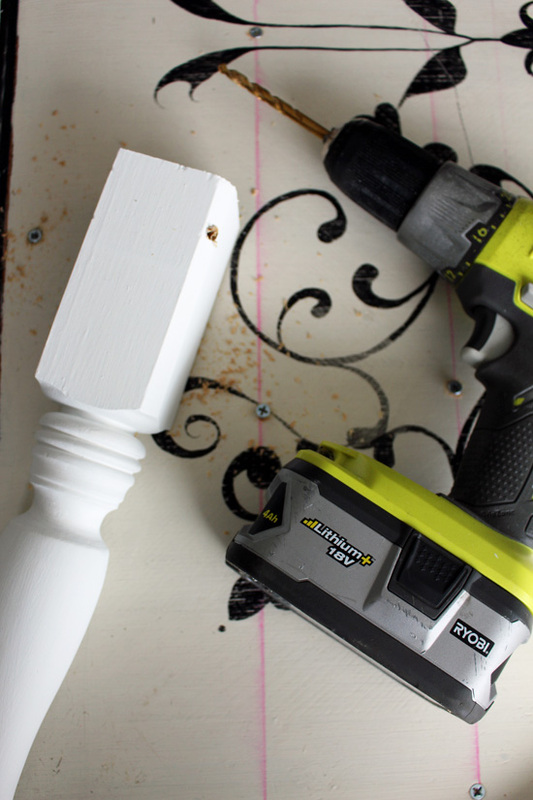 This will act as a guide so you know how deep to go with your drill. The guide that comes with the kit will give you the correct size screws to use. I needed 1 1/4″. 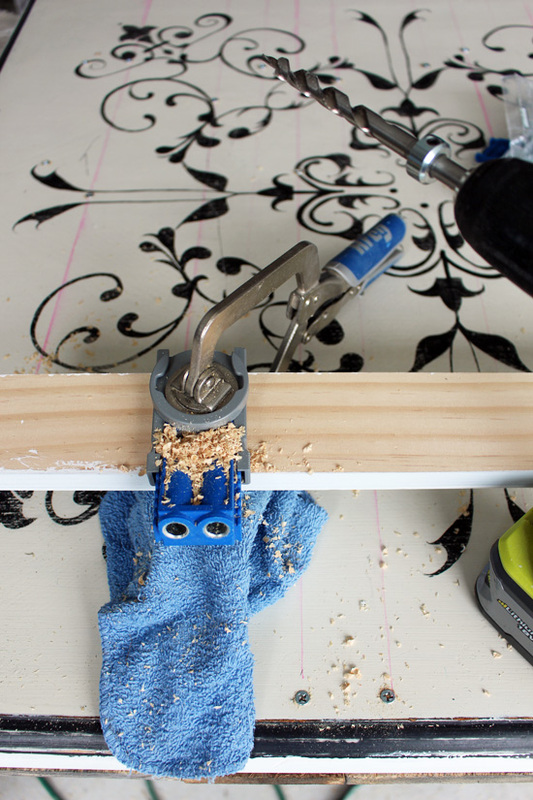 Attach the drill bit to your drill and drill until the ring guide meets the entrance of the hole on the Kreg Jig. The kit also comes with a square head drill bit to be used with their screws. Any type of screw can be used though. Attach your pieces together. 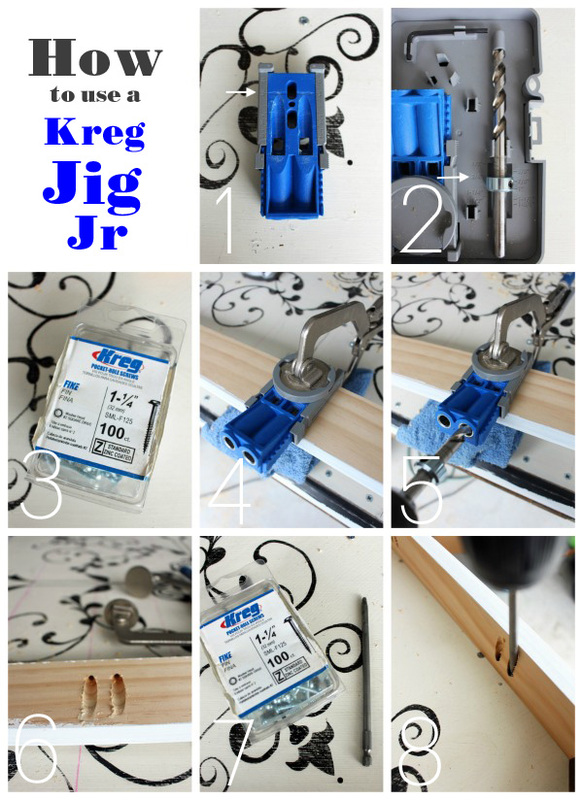 The Kreg Jig makes attaching two pieces at a 90 degree angle a breeze! I liked this look, but I still needed to sand the surface to get it somewhat smooth. Don’t want the kiddos to get splinters in their bums if they should decide to sit on it! I used my rotary sander to sand it somewhat smooth, including all the edges. However that removed some of the natural gray aged look. I decided to use the same weathered stain (found HERE) that I used on my kitchen table. 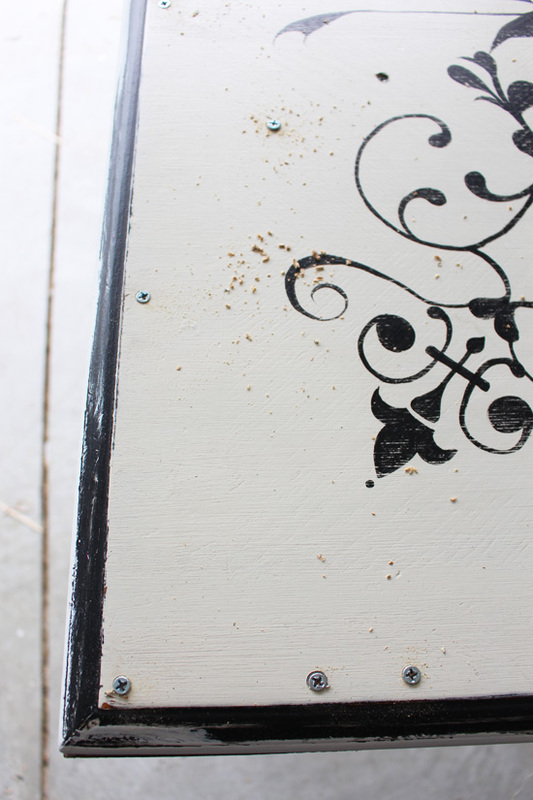 Then I whitewashed the top exactly the same as I did on that table (See how HERE. ), and I sealed it with the same sealer (found HERE) that I used as well. There is a slight gap where the sides meet the top. That’s because the legs and sides are connected to the old table top which had rounded edges. I may still add a narrow piece of trim all the way around to conceal it, but it doesn’t really bother me at all. What do you think? The other one felt very heavy and I think this one looks better with the curtains I chose. Surprise…they’re blue! 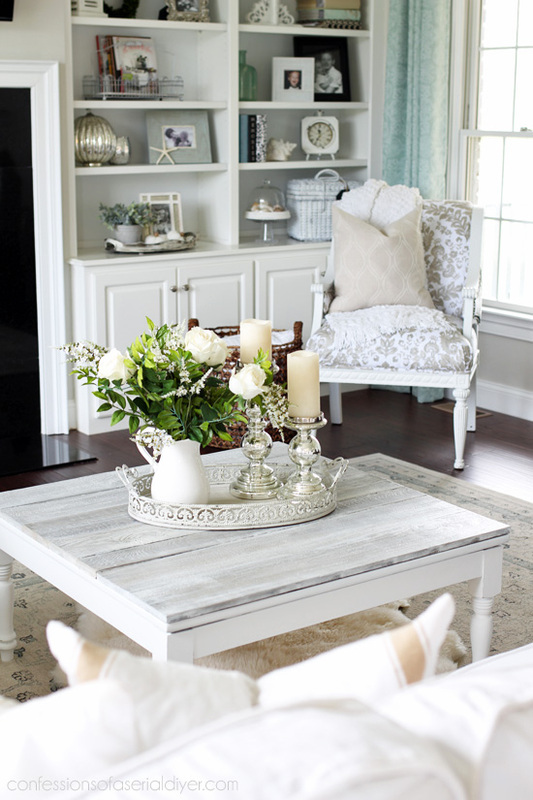 I’ll share more on them and the amazing deal I got on them when I share the final room reveal! I still have a blank wall in there to come up with an idea for, and a side table to decide on, and that room should be done. Bonus!! 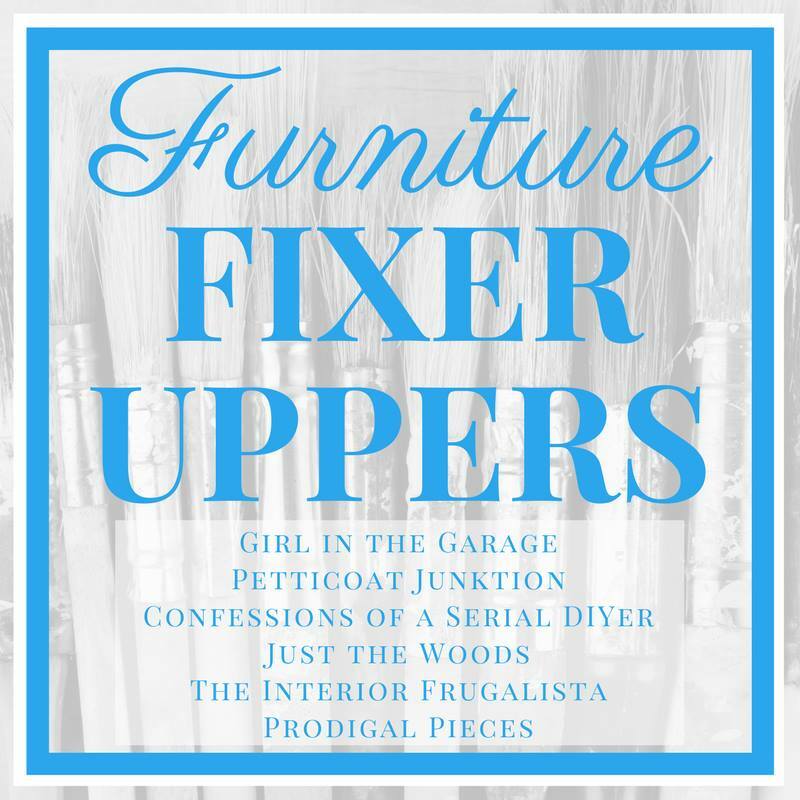 My Furniture Fixer Upper Girls are also sharing furniture pieces they made over today! Visit the links below the image to see the afters! 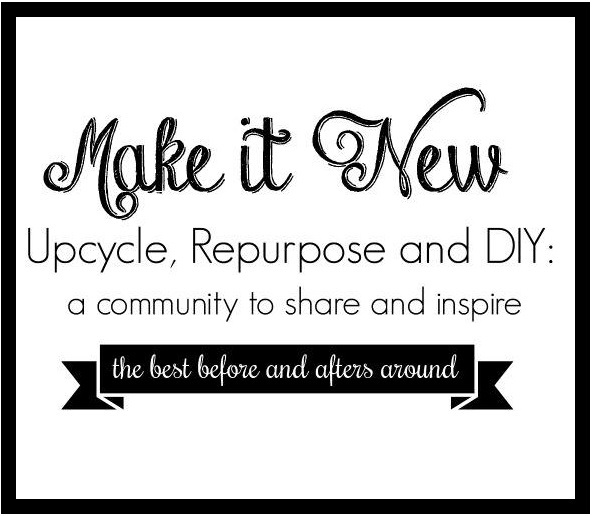 It’s totally free and it is seriously filled with nothing but thrifty makeover goodness. 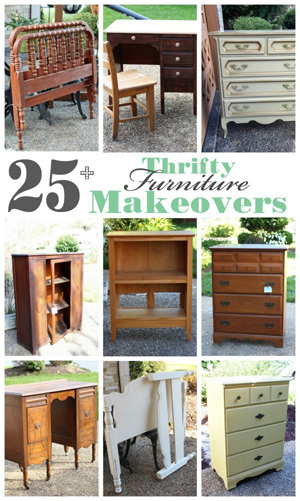 There are also opportunities to share your own thrifty makeovers and finds if you like! Visit it HERE to join in the fun. Whew that seemed like a lot to share today, didn’t it? I hope you enjoyed this redo. I spent $50 dollars to change out the base of my coffee table, but it was still cheaper than buying new! 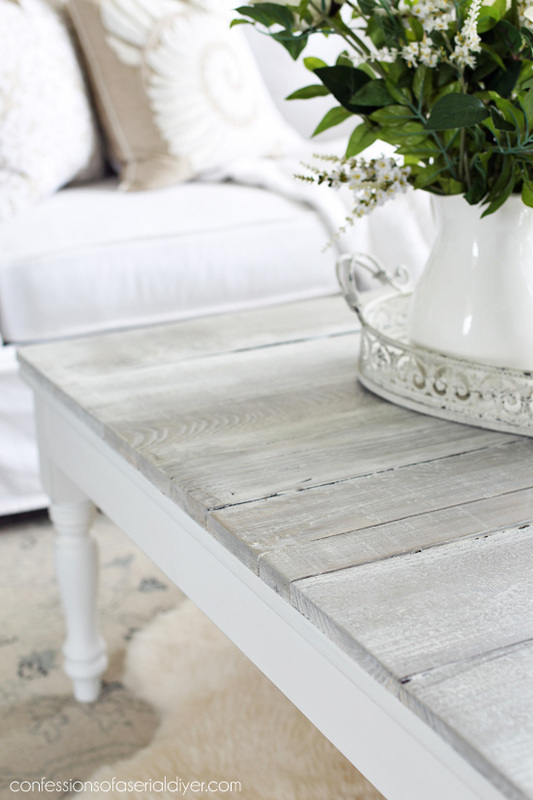 And I got a one-of-a-kind table that fits perfectly with my décor! Win! I think you are amazing! Your husband is one lucky guy to have such a thrifty & talented wife. So creative and fun also, just amazing, LOVE it!! Aww you always say the sweetest things, Mary, and I appreciate you so much! I do save him a lot of money lol! 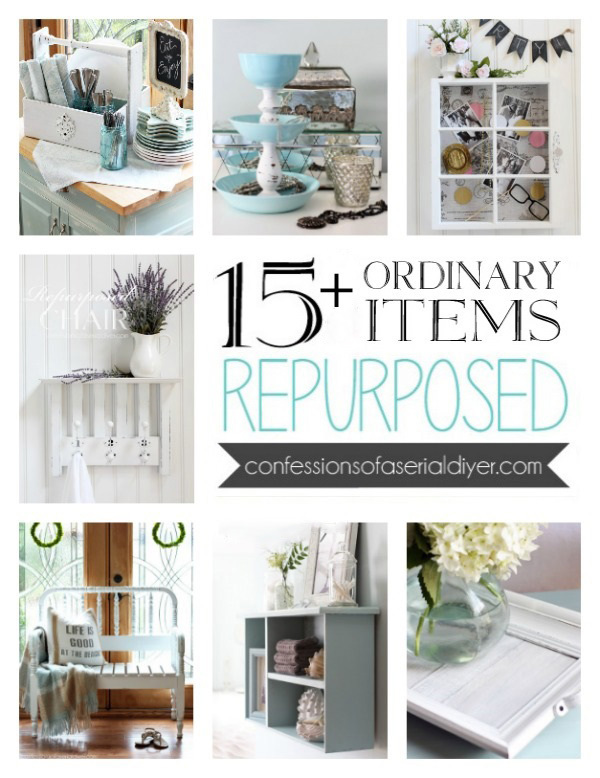 Your table redo is fantastic! I love it! 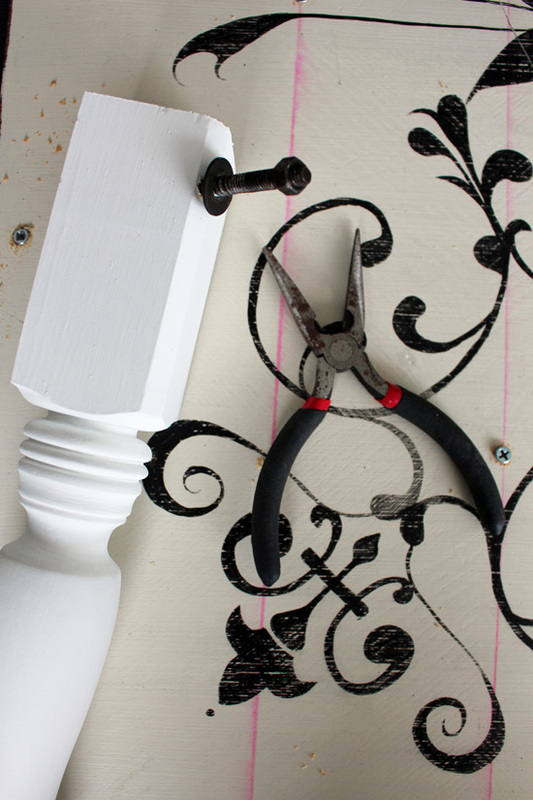 You are a great inspiration for DIY! I hope to find a piece to redo soon. Love all that you have shared! Your blue curtains are perfect! Christy, that was a genius idea!! Love the new look. Love it! And I couldn’t help but notice how perfectly arranged the items on your built-ins are!! How do you do it? I love it. You never cease to amaze me! It is beyond perfect (if that’s possible). Christy, you are so amazing! 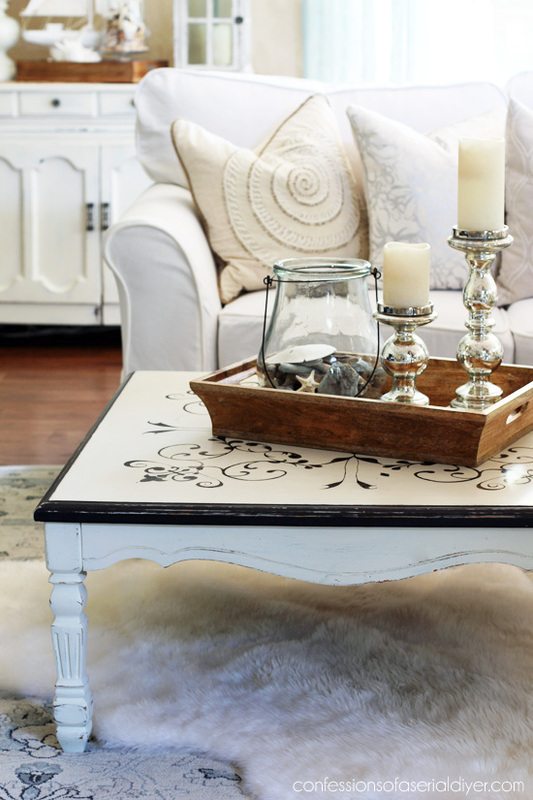 Love the coffee table! It looks perfect in your room. I can’t believe you flipped the whole table over to redo it! I had to read that twice to figure out what you were up to! I agree, the gap is not a big deal and only adds to the charm! Great tutorial, thanks so much for sharing your talents once again! So, basically, you completely rebuilt it. That’s why it looks like a BRAND NEW table. You are amazing, Christy! I have a question about the corner braces – one of them looks broken. I am trying to fix my jewelry armoire that has two broken corner pieces like that one, and I’m not sure how to secure them. Did you just use it as is or did you fill it with wood putty? Or (knowing you) did you cut an entirely new one? OMG! 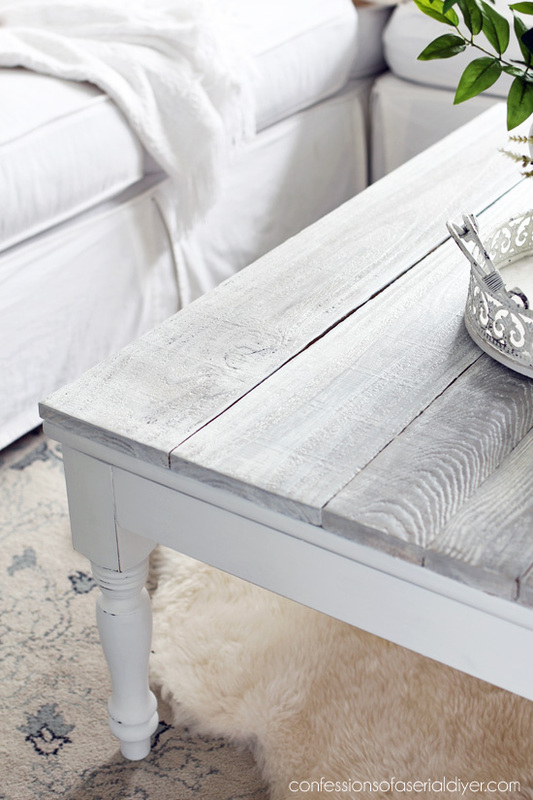 love this table and would love to have the talent you possess! You are so talented with tools! The table top is awesome. Your home is lovely. I like the new mirror instead of the black striped one, but it could go somewhere else. Let your house “evolve”…don’t be in a big hurry to “fill” blank walls, etc. I KNOW you will find a great treasure and make it look fantastic. That turned out Great and what a beautiful difference it made. Love your tutorials. I never would had thought about taking it all apart the way you had done. You certainly a Great inspiration. It’s gorgeous and no one but you will notice the rounded corners under the new top. 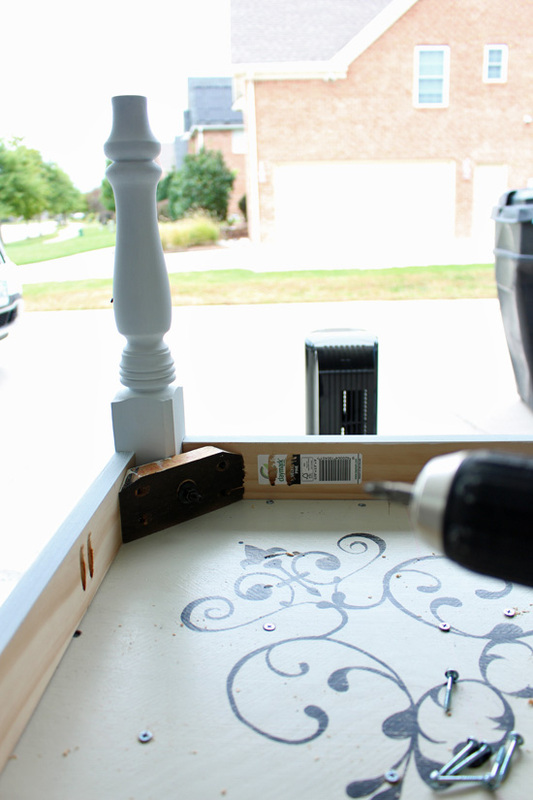 You made the right decision to re-do your old table. What a great looking table , even tho some of us (me) would feel out of depth with all the modifications it took! You really did save a lot of money, my sister bought a used table for $50 THEN had to pay someone $100 to put a reclaimed top on it. 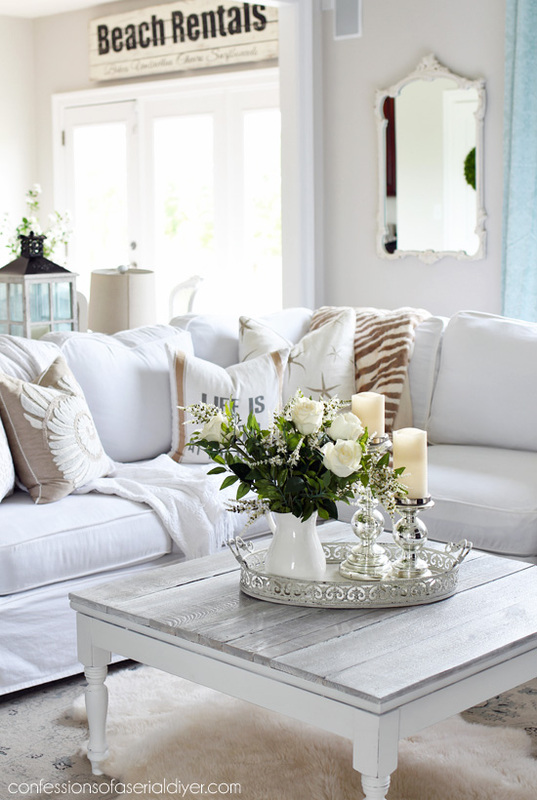 Your living room is coming along , the color scheme is so calm. Good move on changing out the mirror it adds to the lighter feel. LOVE IT! The first thing I noticed, Christy is that you changed the mirror. 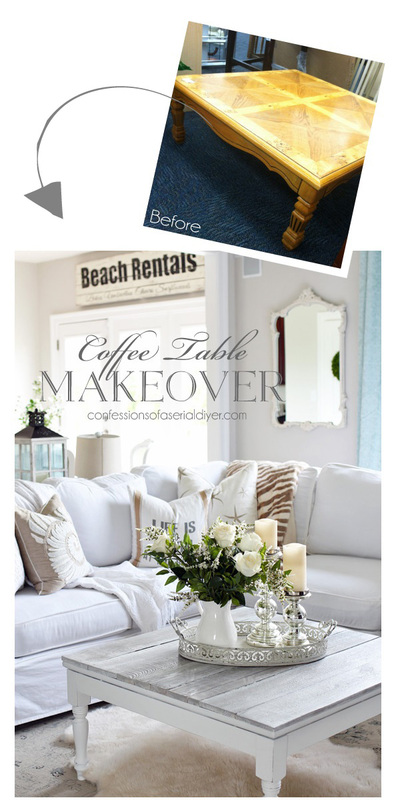 lol I think the original makeover on this coffee table was the first post I ever read on your blog! 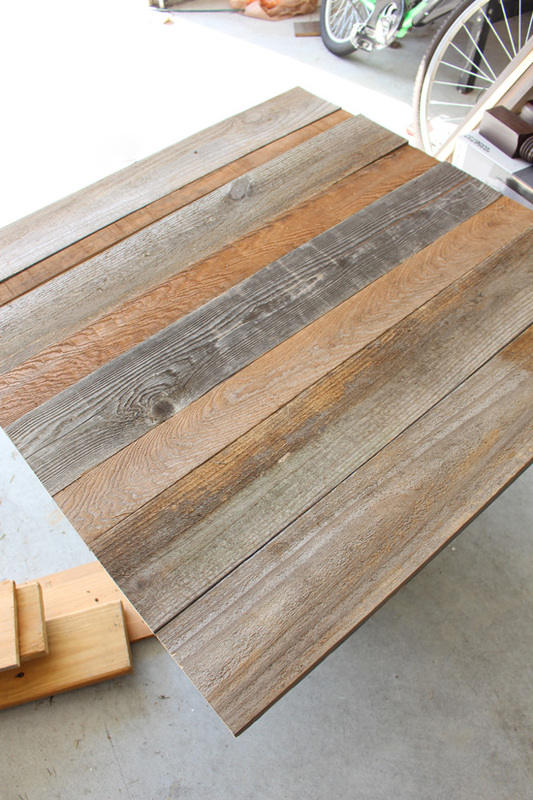 Love the new look – those planks give it so much character. Love how it echoes your dining table too. I’m curious why you decided to replace the legs? Wow and double wow!! You slayed this project and made it into something so beautiful. 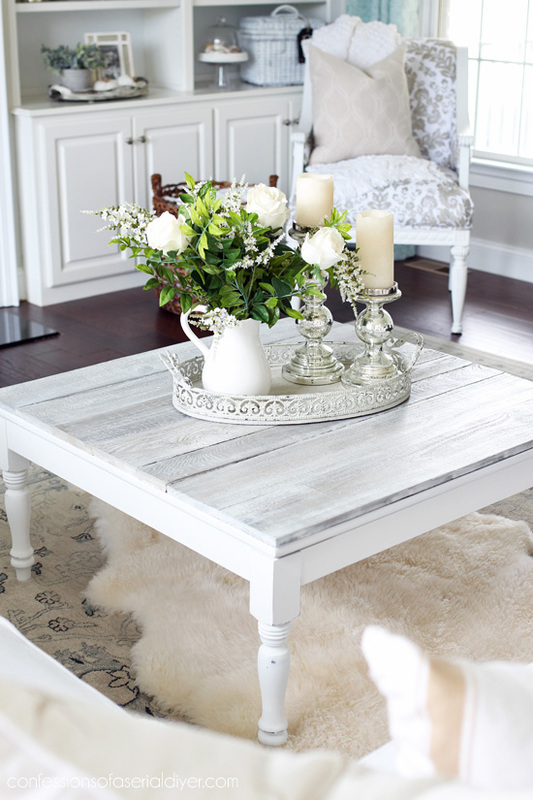 The table has a gorgeous texture, and I really love the furry rug you put underneath. 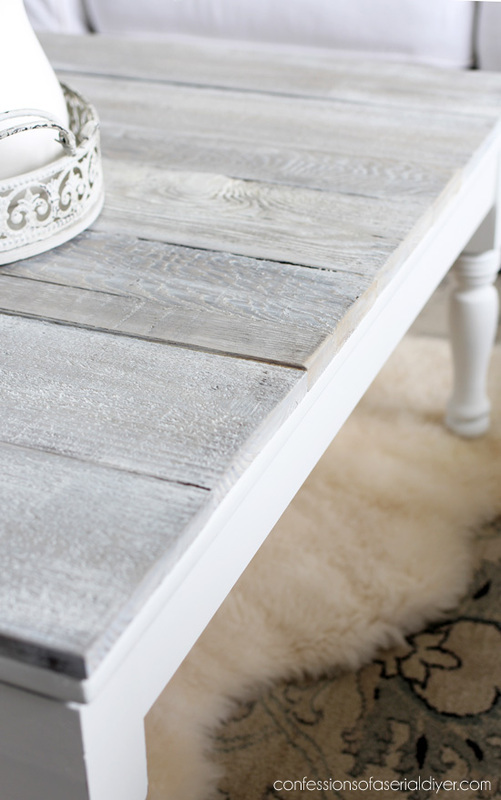 I think the gap areas blend beautifully with the wood on top for an all-over distressed feel to the table. I picked up on the blue curtains immediately Great choice! Can’t wait to see the final reveal. 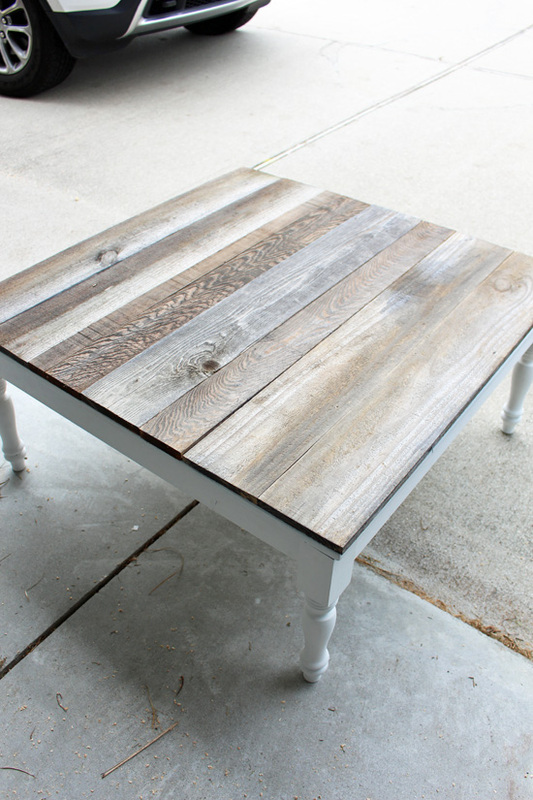 Love the way you finished the table, Christy, and yes, I probably would use a very tiny trim that that have at Home Depot…its near the decorative wood pieces, nice detail, and would fit that space perfectly. Can’t remember the name at the moment, but I’ve used it in endless ways, about 1/2 ” trim w/curves to it. It’s so cute and the table would look even more beautiful. Great Job!!! Beautiful, Christy! Love the wood color/technique. I would leave the gap. Didn’t even notice it until you said something, and I like how ‘simple’ it looks. 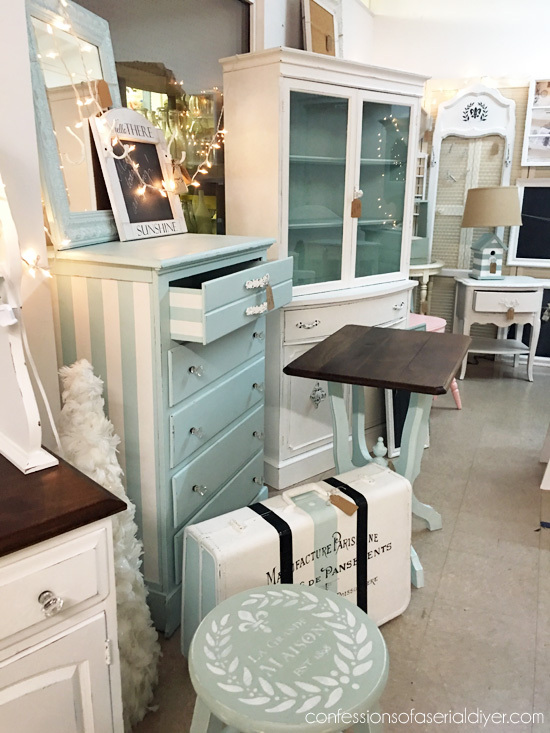 Adding more may take away from the vintage coastal look you have going! I went and looked at your 2013 makeover. I can only hope that my first posts looks as good! Shelves have one last coat of paint to do, and my console is finished! Woot! 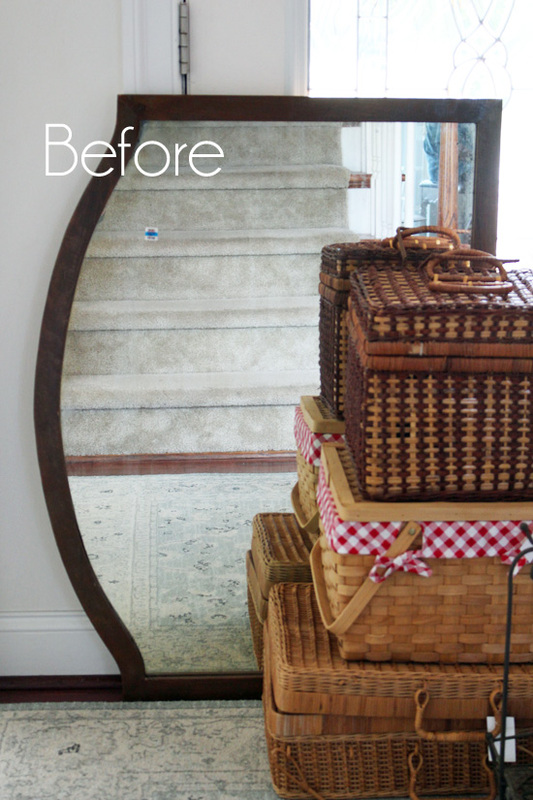 Awesome makeover on the living room table; and the mirror is soooo much better! Christy, you are SO clever – I love the new look!! 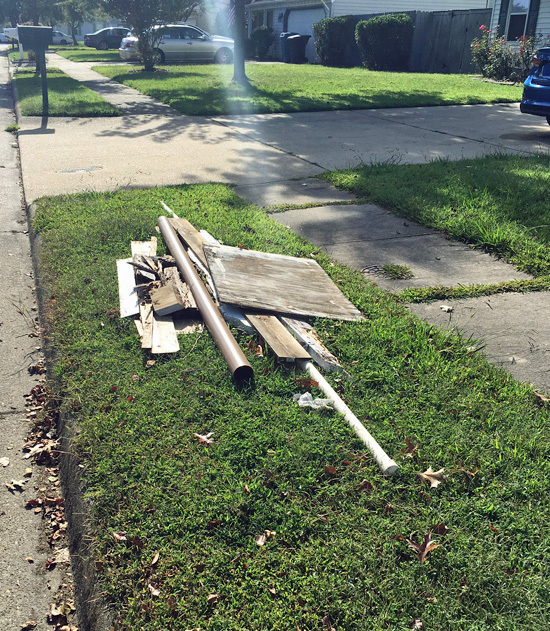 And I thought I had seen all of your old makeovers but I definitely don’t remember that table! It was pretty but I agree that the new look is better for your room now. What a great makeover. 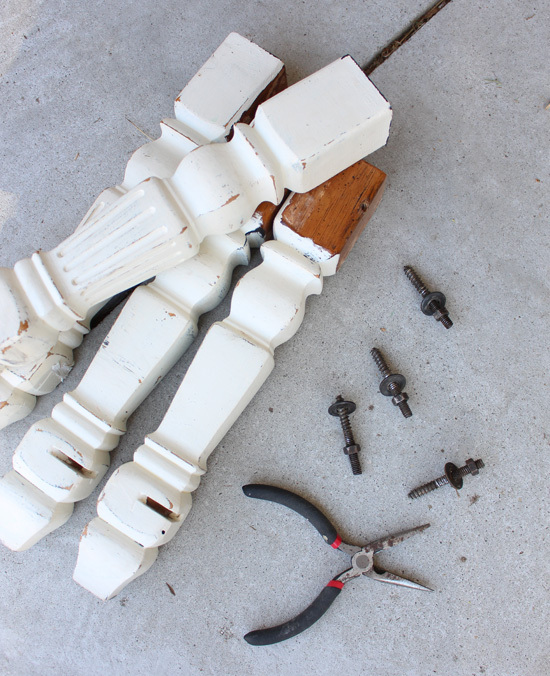 Now, what will you do with the old legs? You are one talented lady! I love the way the table turned out! This makeover table is just gorgeous! Loved the post!